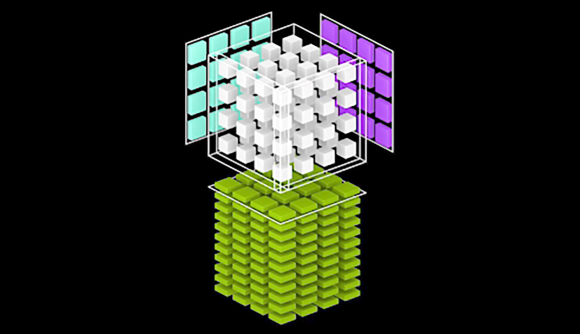 Nvidia has published another use for all the AI tech and Tensor Cores in its Volta architecture: adaptive temporal Anti-aliasing (ATAA). This method imbues temporal anti-aliasing (TAA) with real-time ray tracing to reduce annoying and distracting jaggies in a way that retains far more definition and clarity than contending AA techniques. ATAA utilises real-time adaptive supersampling powered by real-time ray tracing, and the researchers believe it has a capability to run within the constraints of the Nvidia RTX technology and Microsoft DirectX ray tracing API. Microsoft’s DXR API should especially aid ray tracing into making the mainstream, which Nvidia's researchers believe could happen in the next few years. For the most part, the method relies on the TAA anti-aliasing technique that is already available in a menagerie of current games. Except, where TAA would usually struggle to produce acceptable results, often leading to blurring or ghosting artifacts, the new algorithm instead takes over the reins and runs on these challenging pixels to produce preferable high quality results – all powered by ray tracing. Don’t get too excited just yet, however. Even the publishers of the research paper (spotted by VideoCardz) admit this isn’t quite ready for mass deployment right now – at least not on the current GPU tech. The performance just isn’t up to par on current hardware. However, the publishers hold out hope for deployment relatively soon, citing progression in the entire graphics sector inevitably powering ray tracing at some point relatively soon. But ATAA is off to a great start, and is showing promising results already with a Titan V running the Unreal 4 engine with Microsoft’s DXR and Nvidia’s RTX tech enabled. At 1080p, ATAA manages to run at 18.4ms at 8x supersampling, including all the ray tracing steps. 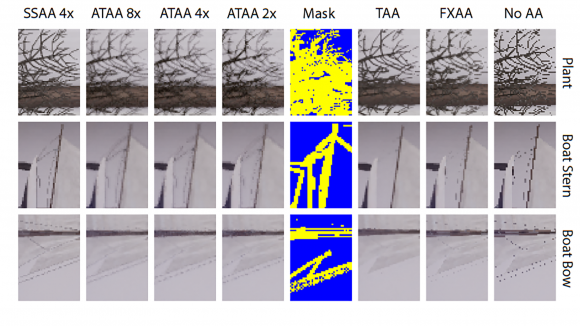 The researchers are pretty confident that as Windows DXR optimisation continues, ATAA performance will also get much better. So will ATAA release alongside the Nvidia GTX 1180? It looks like there’s a chance it might be on the agenda somewhere down the line for the next-gen, especially if the drivers and software can keep up development pace, but there’s still a long way to go before this tech is game-ready. At least it seems evidently clear now that Nvidia are incredibly keen to explore ray tracing and AI applications within gaming. As such, it makes even more sense for the next-gen GeForce cards to feature some combination of Tensor Cores / dedicated ray tracing circuitry right on the die – as the Nvidia’s Volta architecture in its current form features – even if actual uses of the tech within the gaming sphere might look a little premature.